Note: I get a bit wordy here. This is, I think, my first review for this series and I have a lot to say. If all you are interested in is the feminist thoughts on this book go to the *Skip Here* part. Let me start out by saying that this book brings together three of my favorite things: Beauty and the Beast*, werewolves and Mercedes Lackey. I love the 500 Kingdoms series. It is a fun way to play with any and all myths and fairy tales. Lackey has brought in mermaids, fairy godmothers, dragons and even gods/goddesses of different pantheons throughout the series. The basic ides of this series is that the Tradition, this world’s magic, tries to form the world and the kingdoms into the shape of the stories (or traditions) told in the world. People who know about tradition, especially fairy godmothers, use this to either prevent misfortune or gain power/wealth/etc. The things I find as positives about these stories as a whole would probably be viewed by many as negatives. First, it has a sort of humorous feel to it. It is not quite Piers Anthony’s Xanth, but it is more along that idea sometimes. So do not go in expecting Valdemar. She pokes a bit of fun at the traditional myths and manages to, in my opinion, spice up the stale ideas with twists that revive them. For example, to modern Disney fans, Beauty and the Beast is inextricably tied to talking household object that sing, dance and happily serve you delicious grey stuff. In Lackey’s version, they are invisible servants, some smart and some a little more…vacant. They are much more interesting than that, but I am morally opposed to spoilers, so I’ll leave it there. Even though these stories are literally fairy tales and match our modern definition of them, they are still more realistic than other books, which are not meant to be so light hearted. *cough* Breaking Dawn *cough* Especially in Beauty and the Werewolf, the rulers and characters know that their love and even their lives do not trump the welfare of an entire country and the thousands of lives there. The consequences are real. *Skip Here* This story is all about (Isa)Bella figuring out how to fix her situation. She does the research and the legwork. She uses her skills and interests effectively. She also does not get absurdly upset. Some could probably argue she does not get upset enough, but Bella reacts much like I do in stressful and upsetting situations. Give us something productive and helpful to do and we can let the upset and stress straighten itself out in a little corner we rent out to it. Lackey creates a strong female character. Bella does take on a number of “masculine” attributes in the book, learning to fight and wearing pants (in this time period/universe a.k.a. cross dressing) and we can debate whether this makes her a weaker female character** or whether, in conjunction with the “feminine” attributes she strengthens, just makes her a stronger person and therefore a strong woman and good model? Of course, the male lead cannot be left out! The Duke/wizard/werewolf is far from the warrior hero type often found in fairy tales. The Duke (whose name I do not remember and do not feel like looking up right now) is a scholar. He is quite, unassuming, wears glasses (don’t all of us scholars?!) and respects Bella as a student, partner and even at times a teacher. He is a good man in a bad situation that remains a completely and totally good man. Admittedly, his character could be seen as a little flat, but the Gamekeeper (who is basically Gaston) is such a macho and overpowering figure that The Duke’s personality makes a lot of sense. Overall, the book is fun, cute, a sweet romance with female character that does not sit on her lilly-white bottom and embroider while she moans on about how sucktacular her situation is. Which, with my tidal wave strong enthusiasm for all thing’s Beauty and the Beast, is enough for me! I recommend it for all you fantasy fans. Especially any who love a retelling of fairy tales. I mean, seriously, I love Beauty and the Beast. 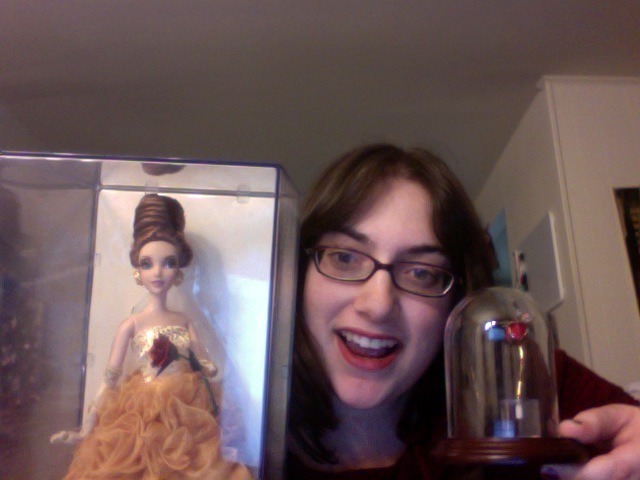 I even have my own enchanted rose and fashion Disney Beauty Doll! *Later I will hopefully write a post about my conflicting feelings about fairytale stories and my feminist goals, but for now we’ll leave it. Mostly. **Does taking on these “masculine” traits mean she has eschewed femininity and her gender? Is she, instead of fighting for her gender and their associated attributes and work to be valued more highly, just aligning herself with the masculine and benefiting from that? 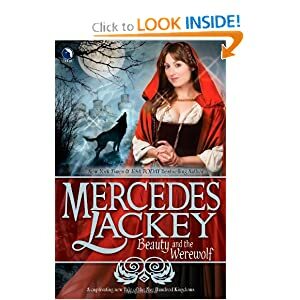 This entry was posted in review and tagged beauty and the beast, Beauty and the werewolf, book, disney fans, feminist thoughts, mercedes lackey, opinion, review. Bookmark the permalink. I love the 500 kingdoms series, but my favorite is still the first one, about the cinderella who becomes a godmother. Who doesn’t love seeing the male character get taken down many, many notches? Speaking of retakes of fairytales, there’s another series whose name I’ve forgotten that’s set in Seattle, of all places. Have you read it, or should I go try and figure out what books I’m talking about? I don’t think I have read that one. It doesn’t ring any bells at least.